William Baker. Photo courtesy of Jackson County Sheriff’s Department. A Seymour man is being accused of murder after allegedly shooting his brother in law to death in the parking lot of a grocery store yesterday afternoon. 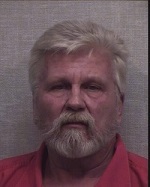 The Seymour Tribune is reporting that 61-year-old William Baker is accused of shooting 33-year-old Dustin Payne in the parking lot on Tipton Street at just before 6 last night. Payne was exchanging his children with his ex-wife when he got into an argument with Baker. Payne was shot once in the chest with a revolver, according to the newspaper. Payne was taken to Schneck Medical Center before being airlifted to University of Louisville Hospital in critical condition and later died.